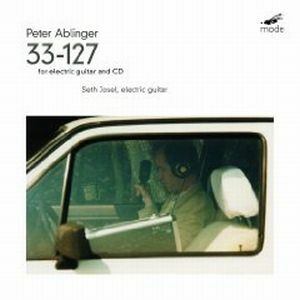 Peter Ablinger's 33-127, for electric guitar and CD, is an infuriating work. Maybe that's half the intention, if intention there is – for we are in post-Cage territory here. Then again, isn't all current day experimental music post-Cage? Cage in this respect is the blank canvas, the absence of music, upon which all experimental composition might wend its way and reject its listener and be applauded accordingly. He is contemporary music's white noise. 33-127 is made up of a slow descending scalar passage played ninety-five times on solo electric guitar, the instrument articulating this scalar motion in a clean, measured tone. The banality of tone is not unlike that of a piano playing a similar scale over and over. This lends a sort of constant neutrality of timbre and dynamic that provides a context for some slight shifts in pitch and rhythm that occur. The interest in this repeated process is focussed on what the scale is doing rather than on any rhetoric that would otherwise be available to the instrument. The minor irregularities of rhythm and pitch that occur during each scale cause a slight wobble in what is heard and dispel the possibility of the figure's being entirely mechanical. Only just, as it is a highly boring figure, and this is the intention. But the most prominent feature in the work is the sharp outburst of 'noise' (I'll come back to the inverted commas in a moment) that accompanies each run of the scale in its slow descent, bursting in each time at a different point for a variable duration. The airing of this noise triggers the guitar to explode in kind, scrawling wild and ragged phrases and atonal flashes across the haze of its background, before the outburst ends, just as suddenly as it began, to leave the descending scale continuing from where it left off, plodding downwards towards its end. The track ends and then begins the next one, to all extents and purposes exactly the same. The idea of noise in music is one that has grown in importance over the past few decades, and it here features prominently. Ablinger's view is that noise describes to us the very act of hearing – it is a foregrounding of that passivity we always inhabit as listeners, usually in a mechanical way, unbeknownst to ourselves. Noise would describe the necessity of hearing: not something that is to be equipmentalised in human endeavour, such as 'musical' composition; but rather to be allowed inhabit its own sovereign space, unadorned and inviolate. Ablinger might sneer self-righteously at a figure like Lachenmann for trying to co-opt noise. The problem I have with this is that by definition all music is noise at its most basic level; and that to this extent the quality of being noise wouldn’t exclude something like, for example, Beethoven's Appassionata, if that work is thought purely in terms of timbre. Noise, as indeterminate hearing, is inscribed in that work just as much as it is in the random everyday sounds we hear – without 'hearing' ourselves hear – when walking down the street (the noise bursts in 33-127 are samples of Berlin street sound). Privileging street noise over musical noise is to give unwarranted priority to one over the other, and is a simple inversion of the norm. This is a similar situation to that of Cage's (determined) 'indeterminacy'. Each track here is the same length: thirty-eight seconds long. Looking at their list on the reader of the CD player fills you with an empty feeling, and a little dread. Why am I listening to the same uninteresting figure, played over and over again? What possible enlightenment is there to be gained? And for ninety-five tracks? Brave would be the listener who would brave it. For sure it's one to listen to on your own and not to be thrown on at a party, unless you want to be thrown out. Then again, maybe you do. Maybe Ablinger fancies himself compositionally as dealing with what has been thrown out of the house of music: that, seemingly lacking in interest, which has been banished to the periphery. Hence the gesture of the guitar playing an inane passage over and over again, occasioned by negligible differences each time, conjoined to a similarly recurring passage of street sound and lowly-mixed distorted guitar gesticulations, the recurrence of which renders it equally banal. It may be that this is an aggressive act of reduction, one purging music of all humanistic pretension, and then waxing compositional with what is left over, presenting this detritus as the face of music that is always hanging around but is rarely glimpsed, listeners instead usually opting for more attractive climbs, ones better suiting his or her vanity. The party's over, this is the only CD left in the abode, and you are being forced to listen to it: you haven't even slept yet, and it's the light of day again; music died at some unremembered point in the last twenty-four hours and this is what you're left with as company: a desert island disc of sorts, the last one you'd willingly choose. The listener grows to accept 33-127 as it progresses further and further (and further) down its Groundhog Day-esque way. The experience is like watching paint dry (I'm presuming), or listening to a long lecture by Gertrude Stein. The territory the piece maps out over its course sees the realization dawn upon the listener somewhere along the way – the listener, at least, who is still listening – that the opposition of white noise and banal guitar scale, which appeared initially to be a total one, which provides the material of the work, is actually not such an opposition at all – they both come, by repetition, to display the same properties. It is a new sonata form, then. The piece as a whole displays the same properties overall as each of the multitudinous short cells of which it is composed: a canvas of white noise, even in the seeming ratiocination of the scalar intervallic flow. But growing to accept this is not growing to love it, or even to like it, or have any fondness whatsoever for it; although who is to say there aren't people out there who will like it. They may be the same kind of people who like Satie's Vexations, or the idea of it. The idea of music often stands in the guise of the real thing.